This is our second day at Chisomo River Lodge, a 19,000 hectare peace of beauty on the outskirts of Kruger National Park. We arrived yesterday, but I didn’t send an installment yesterday. I may not today. Why? Because part of the great beauty of this Lodge is that it’s Internet connectivity is so weak. What joy! We are staying in what might be called fancy tents, arranged along a pathway that is primarily lit by the evening stars, and the sliver of a moon that has appeared. Occasionally warthogs and what may be nyalas dart across the paths, which is a comfort in that they are not lions, which likely don’t have access right?! Right?! Who knows at the beautiful Chisomo River Lodge. We arrived last afternoon after a fascinating 6 hour drive up from Johannesburg, past the mining heartland of this great land (scarred coal fields) that gave way to lush river valleys, even if the rivers themselves have dried up from a long winter. Hovering in the background then, and at the camp, are the Drakensberg Mountains. 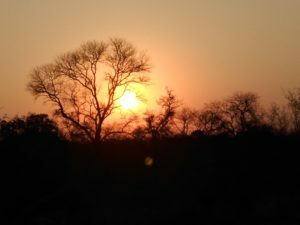 We went on a game drive yesterday and two today: the first at 6 a.m., starts in the cold darkness of this land and ended in early morning light; the second drive began at 3:30 p.m. and ended in the darkness that settles in around 6:30. We split up into two groups and were led by some engaging and knowledgeable guides, who bumped and jostled us up and down roads that are really trails. The views are lovely start to finish, and we were fortunate to see buffaloes, cheetahs, giraffes, a rhino, and even, most amazingly, a leopard. At times you simply gaze at a distance, and you can’t help but consider the wonder of this great creation, and that we are here. Our meals in this intimate setting are either laid out in a small wood-lined dining hall or outside before a great “brai” fire. And in between is time for us to become acquainted with each other, to make connections, and to ponder this country’s past and future. Spirits are high, and many people will have too many photos to sort through. But that’s hardly a large problem is it in this magical adventure that is called South Africa. We start our last full day tomorrow here. Now if I can just get the internet to work so that I can send this in! Strange as it is for our group, our days at Chisoma River Lodge are over. Part of our group has already left for the airport and Cape Town. The rest of us will follow in about 3 hours as we shift gears. But what a glorious times it has been. We could go on. 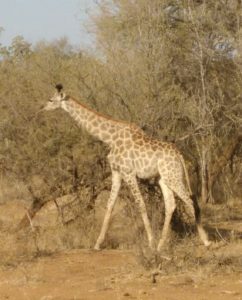 Suffice it to say that this has been a terrific base for us to see a portion of South Africa’s rich flora and fauna. Today was our first full day in Cape Town, and what a day it has been. We started the day with an early drive to the foot of Table Mountain, a mountain range that defines Cape Town in a way that is almost without parallel in the world. We ascended to the heights of this world landmark (by gondola, it must be said!) and spent an hour in awe at its structure and the views that it afforded. As one person said later, it was beyond what she had imagined, and she had had high expectations coming here. We then went to Kirstenbosch, Cape Town’s famed botanical garden. It is also a UNESCO sight all by itself, because it brings together one of the richest collections of flora found in the world. The early spring, South Africa time, meant that we were already treated to the first magical appearances of the proteas and “Birds of Paradise” for which this region is renowned. 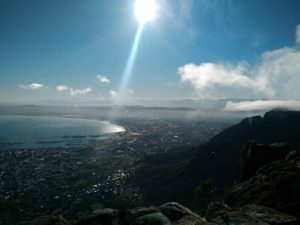 We explored some of the highlights only, including the recently opened canopy walked, and then slowly made our way back to the entrance, all the while gazing up at the “back end” of Table Mountain which towered over us. It must be said that our visit to Kirstenbosch was inspired by Mary Friesen, co-planner of this tour, and intended co-leader, whose love of this Garden was already known to several on this tour. All of that, and we were barely into the afternoon! We decided to leave the tour buses at that time, or the seclusion of city hotels, and instead were dropped off at Greenmarket in the very heart of this grand city. There we entered the food emporium known as The Press Building and treated ourselves to a few of its many delights. Thereafter some walked back to the hotel, others went to the V & A Waterfront to explore there on their own, and still others wanted back through the historic centre of Cape Town. Why go on TourMagination? I can’t think of a better example of this than what we saw today, and for three reasons: first, it does much more than simply show you the great sights of whatever you are seeing. Instead, it is intent like this tour, in getting you on the street. With the local people. Second, TourMagination isn’t in a hurry. We will still be in this city for 5 more days. On Table Mountain we bumped into several tours that have flown half way around the world to this great city only to leave within a day or two. Not us. We want to do more than scratch the surface. And third and last, TourMagination is about community, and not just the community we encountered this afternoon in Cape Town proper. It is also about the community we create when we travel together. This was clear this evening as we gathered together as a group, and again headed into Cape Town, this time for an evening meal at a local Turkish restaurants filled with South Africans, and not more tourists. There we shared of the adventures of the day and looked ahead to tomorrow. There was much laughter, and even a bit of a presentation on “why Nelson Mandela matters” by me. All to prepare us for tomorrow and yet another adventure.